I'm guessing many people will avoid this post because they fear it will be controversial or divisive. My intention in this post is to share some of my opinions and encourage people that are married. I have no intention of casting stones or hurting feelings. If you are a divorced person, I have no intention of correcting you or telling you how to live your life! So please, just keep reading. I know about divorce second-hand, since my parents were divorced when I was ten years old. Like so many American kids, my brother and I watched what divorce can do to a family. That doesn't mean our family imploded and we all hate each other! Quite the contrary, my brother and I have a good relationship; and I love and stay in touch with both of my parents. But I think we can all agree that, with the exception of the infamous "gold-diggers," divorce is never part of the plan. It's not something we aim for, or wish for. We don't wake up one day with aspirations of separating from the person that we claimed to love more than anyone else in the world. No, I think divorce happens for other reasons. Before I go on, let me say this post will NOT discuss the moral/spiritual aspects of divorce. If you are a Christian, you might be offended by this; but I intend this discussion to be more practical and less moral/ethical. The Christian perspective of marriage and divorce can be kept for another post. I know some people who are divorced. I don't mock them or look down on them. I'm not pointing fingers or ascribing blame. However, I am married; and I have a good idea of what it takes to have a healthy marriage. So let me make a bold statement. Divorce is the default end of marriage. It WILL happen unless a married couple puts time, energy, and thought into avoiding it. Divorce is not some freak accident, like a tornado or getting struck by lightning. Too many people treat it that way--like it could happen, but really it will never happen to them. So they go about their merry ways and take no precautions against it. Let's face it--if we don't think it can happen to us, we don't do much to stop it. If you think you'll never get in a car accident, why would you ever wear a seat belt? They're uncomfortable and annoying! So what are the reasons people get divorced? Wow. This could be a long list. I won't be exhaustive. Life can be complicated. But if we contemplate the similarities amidst the complexity, I think we can extrapolate some common themes. Everyone has a different story, but we are all made from the same stuff. Sure, married couples can have different interests and different careers; but that makes it more difficult to have united leisure and marriage-centered goals. My advice to myself is to try to incorporate myself as much as possible into my wife's life, and vice versa. I don't want to have separate things that are "my own." I want our lives to be one life--together. As I said earlier, divorce is the default end of marriage. Why? Because people are naturally selfish. 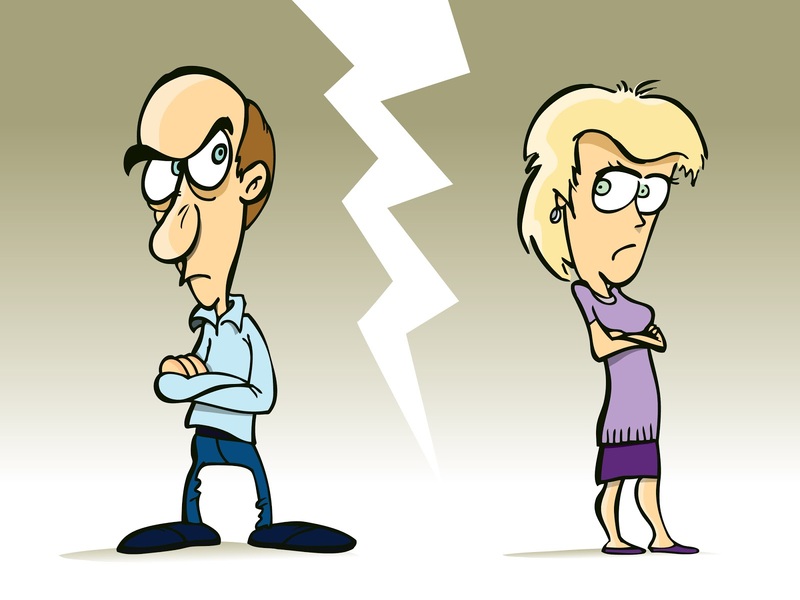 If one or both partners in a marriage hold on to their selfishness, it greatly increases the chances of divorce. If you are married, you know your spouse can drive you crazy--like crazy angry. They get under your skin and squirm around in there like sand paper rubbing on your eyes. Yep, they can do that because he/she matters so much to you! What do you do with that? Do you learn from it? Do you communicate to your spouse about it? Do you work it out? Or do you bundle it up in a wad of resentment and stuff it in the quiet, dark corner of your mind labeled "Bitter, toxic poison?" If you do the latter, divorce is lurking nearby. I'm not saying it will happen to you, because some people choose to live in "functional divorce status," in which they remain legally married, but live completely separate lives. They no longer love each other or care to be with each other, but they're legally connected on paper. So yeah, Bill and Hillary are still "married." But that's not what I'm shooting for. Are you? I hate to even say this, because it comes across like I know everything; but some people probably should never have married each other. It sounds mean to say, hence my hesitancy. Yet it needs to be said. Choosing a spouse is so incredibly important! It needs to be done with counsel and reason. There should be a huge element of romantic love involved, but that shouldn't be the ONLY element involved. People ought to think long and hard about whether they can really, honestly, truly live every single day with this person; whether they can involve this person in the most intimate aspects of their life; whether they can trust this person with their money, their children, their future, and their heart. Sadly, it seems many marriages end early on because people didn't think it through very well. They rushed into the excitement of getting married without asking the tough questions. Unmarried people have some funny ideas about what marriage will be like. I know I had some misconceptions. I think we all have some. It becomes dangerous when our unmet expectations become cause for resentment, which leads us back to #3. A person can quickly become dissatisfied with their marriage if they have absurd ideas of what marriage, or their spouse, should be like. Whether you're single, engaged, happily married, unhappily married, or divorced, I hope this post did something positive for you. I am not an expert on marriage, but we do have seven years under our belts. I'm pretty happy about that. I look forward to the future with hope and anticipation that our marriage will be wonderful "for as long as we both shall live." But that's going to take some work. It's going to take some sacrifice. It's going to require being intentional about it. If you have comments or suggestions, please put them in the 'Comments' section so we can all benefit! The second to last paragraph pretty well sums it up...work, sacrifice and on purpose. Great article! I to come from a divorce home, so I totally understand what it does to the kids. I also understand how much work sacrifice and commitment that goes into a marriage. November will be my 17th wedding anniversary and 20 years of being with my wife. We are still together because we choose to love one another. There were times when I wasn't so lovable: but my wife chose love me anyway. It wasn't something I deserved or earned. She freely chose to give me her love. Just as I have done for her. I chose to love her till I die. And for the last 17 years we have tried to make one life instead of seperate lives. I pray everyday that God will me with wisdom to lead my family the way He would want me too. Colby, congratulations on 17 years! Marriage can be amazing, but it can certainly be difficult at times. During those times, as you said, we need to decide to love our spouses in spite of their behavior. If unconditional love isn't at the foundation, it probably won't last very long. Thanks for your thoughts.